Divided government is good for America’s economy. Or, to be more specific, divided government is a net plus if the alternative is to have statists fully in charge of economic policy. I made this point back in 2012 when I pointed out that the unemployment rate started falling after Republicans captured the House of Representatives, and we got further good results when gridlock led to an end to extended unemployment benefits, first in North Carolina and then the entire country. We also see positive evidence in the new rankings from the Fraser Institute’s Economic Freedom of the World, which was published this week. As you can see from this chart, the United States fell in 2010 to #18 in this global ranking of economic liberty, but now America has improved to #12. That’s still far below our #3 ranking when Bill Clinton left office, so we’re still paying a high price for the statist policies of both Bush and Obama, but at least we’re finally moving back in the right direction. If you look at the underlying data, you can see why America’s score has increased since 2010. There was a slight improvement in the scores for trade and regulation, but that was offset by declines in the scores for monetary policy and property rights. Fiscal policy is the area where there was a significant improvement for the United States, which matches with my data showing that sequestration and the Tea Party made a big difference by significantly slowing the growth of government spending. But the improvement over the past two years, as noted above, is small compared to the decline in the previous 10 years. 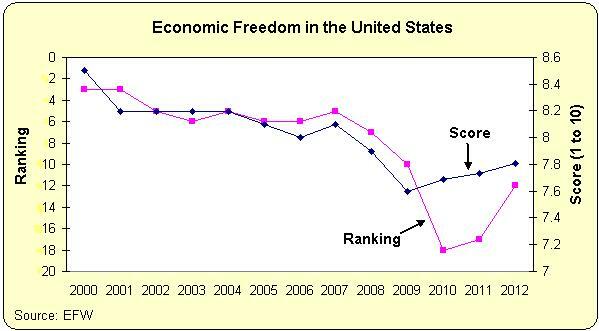 Here’s how Economic Freedom of the World describes America’s fall. The 7.81 chain-linked rating of the United States in 2012 is more than 8/10 of a point lower than the 2000 rating. What accounts for the US decline? While US ratings and rankings have fallen in all five areas of the EFW index, the reductions have been largest in the Legal System and Protection of Property Rights (Area 2)… The plunge in Area 2 has been huge. In 2000, the 9.23 rating of the United States was the 9th highest in the world. But by 2012, the area rating had plummeted to 6.99, placing it 36th worldwide. …the increased use of eminent domain to transfer property to powerful political interests, the ramifications of the wars on terrorism and drugs, and the violation of the property rights of bondholders in the auto-bailout case have weakened the tradition of strong adherence to the rule of law in United States. …To a large degree, the United States has experienced a significant move away from rule of law and toward a highly regulated, politicized, and heavily policed state. Geesh, we’re becoming another Argentina. Looking at the big picture, a falling score is not a trivial issue. The decline in the summary rating between 2000 and 2012 on the 10-point scale of the index may not sound like much, but scholarly work on this topic indicates that a one-point decline in the EFW rating is associated with a reduction in the long-term growth of GDP of between 1.0 and 1.5 percentage points annually (Gwartney, Holcombe, and Lawson, 2006). This implies that, unless policies undermining economic freedom are reversed, the future annual growth of the US economy will be only about half its historic average of 3%. Amen. This is why I worry so much about the corrosive impact of big government. Now let’s look at the overall ratings for all nations. 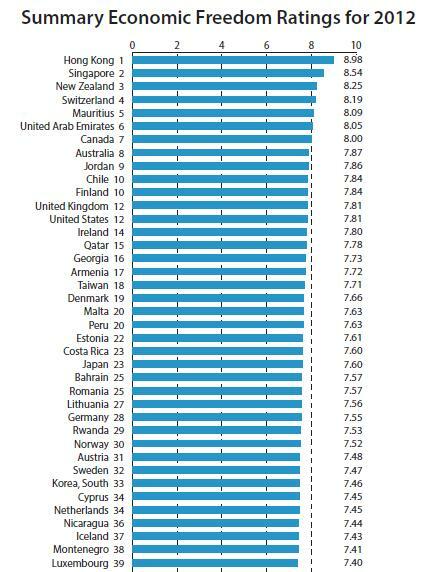 The chart is too large to show all nations, so here are the nations with the most economic freedom. You shouldn’t be surprised to see that Hong Kong and Singapore own the top two spots. Other nations with very high scores include New Zealand, Switzerland, Mauritius, UAE, Canada, Australia, Jordon and Chile. Getting a good score today, however, is no guarantee of getting a good score in the future. I’ve already expressed concern about Australia moving in the wrong direction, but I’m even more worried about Chile. That nation’s socialist President is making very bad moves on fiscal policy, and also is trying to undermine her country’s very successful system of school choice. But it would take a lot of bad policy for Chile to drop down to the level of Venezuela, which has the dubious honor of being in last place. I don’t think it is america getting necessarily better, I think it’s just other countries ranked higher than us getting worse.